The filter medium Purigen by Seachem is an absolutely unique product, and every aquarium keeper should use it! It doesn't matter if you have a social tank, a planted aquascape or a marine reef, using this highly versatile filter material is worthwhile in any case. Purigen is a synthetic adsorptive resin, based on a specific polymer. It is expressly not an ion-exchanging resin that would absorb and release certain substances; it removes organic nitrogen compounds and other organic substances like proteins from the water permanently, and so it reduces water pollution. Consequently, the redox potential in the aquarium increases. In addition, Purigen removes discolorations of the water, which for example may have been caused by the use of driftwood efficiently, effectively and quickly. After some time in use, Purigen indicates its waning receptivity by a color change: it grows darker. A dark brown shade indicates that the filter medium should be regenerated. 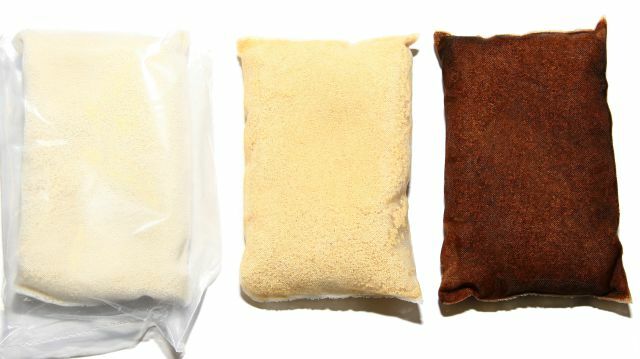 Bagged Purigen in different states. Left: new. Central: after light use. Right: after prolonged use. Purigen can be used in any type of filter: External filter, internal filter, filter sump or filter shaft. Preferably, it should be placed in an area with a good current. While the 100 ml version comes in a sealed bag ready to use, the material is loose in the larger package sizes. If you buy large, you should place the product in a filter bag that allows you to use the Purigen that is recommended for the size of your aquarium. The mesh should not be too large, in order to prevent the tiny Purigen particles from escaping the bag. We recommend the special filter bag The Bag by Seachem, which is re-sealable and chlorine-proof. These factors are important when it comes to regenerating Purigen, which we’ll cover later. Purigen is a great tool during the start-up of an aquascape or planted aquarium, especially when the design requires driftwood, which has a tendency to stain the water by leaking humic substances contained in the wood. Purigen keeps the water crystal clear from day one. Soil substrates such as ADA Amazonia, which leak quite a large amount of nitrogen compounds into the water in the beginning, are "defused" somewhat by the absorptive capacity of Purigen. Unlike activated carbon, it has no significant effect on iron and other trace elements that are important for the growth of your aquatic plants. Although the organic precursors of nitrogenous compounds are absorbed, Purigen does not remove nitrate, urea and phosphate, so your aquarium plants still have sufficient amounts of the macronutrients they need. By removing organic compounds, Purigen acts as backup for the protein skimmer. After a certain time of usage, the effect becomes noticeable as nitrate and phosphate levels in the open water decrease. Purigen removes the yellow tint from the aquarium water and ensures a crystal clear view. The corals will grow better, too: Thanks to the clearer water, more light will reach them. Unlike activated carbon, Purigen has practically no effect on the trace elements in the water and therefore doesn’t absorb significant amounts. Purigen has the ability to absorb the toxins emitted by the cnidoblasts of the corals and anemones and creates a better ambience for all inhabitants of the reef aquarium. The performance of many other resins decreases over time, and regeneration can be quite cumbersome. Purigen indicates its absorptive capacity through its color, which turns more and more brown with increasing saturation. Its functionality is restored super easily with common household bleach. You'll find detailed instructions how to regenerate Purigen in our Wiki article here.